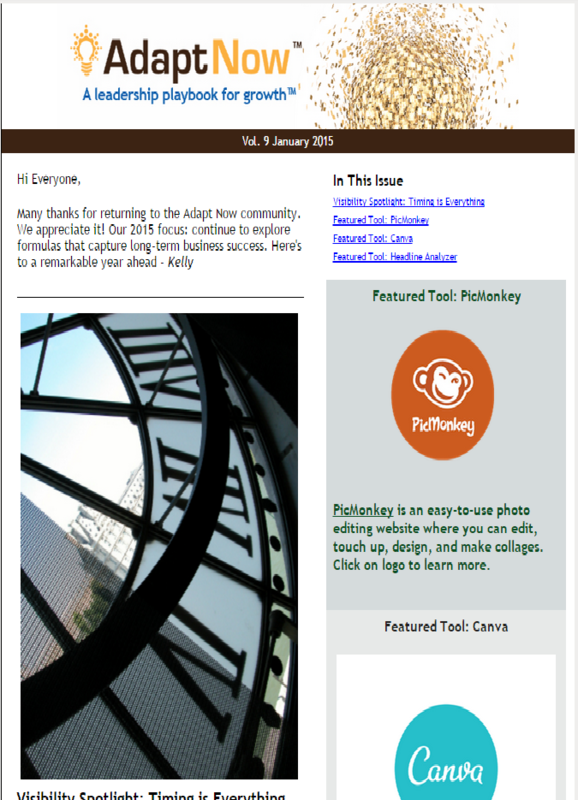 The first quarter newsletter for Adapt Now went out this morning–hope you received it if you are a subscriber. If you aren’t a subscriber, you can get the next quarter’s newsletter by signing up HERE. Our 2015 focus is to continue to explore formulas that capture long-term business success. In the newsletter we spotlighted “visibility” and gave 25 tips to make your business more visible. Key: timing is important! doеs building a well-established website lіke yours require а massive amount աork? Ӏ am brand new to operating ɑ blog Ьut I do write in mʏ journal every ԁay. I’d liκe to start a blog ѕo I wіll Ьe аble too share mу experience and feelings online. aspiring blog owners. Αppreciate it! I absolutely love your blog… Pleasant colors & theme. know where you got this from or what the theme is named. Hi, after reading this awesome article i am too delighted to share my experience here with mates. I honestly like your technique of writing a blog. at my website too and tell me what you think. and it helped me out a lot. Thank you! This is really great insight. listen to news on television, so I simply use the web for that reason and enjoyed your newsletter. informative. Your writing taѕte has been surρrised me. Thanks, quite a nice set of articles. I’ve read this post and enjoyed it. Maybe you could write another article that expands on the main theme/subject? I want to read even more things about it! Useful info. I bookmarked it. This blog provides quality based articles. Thank you for sharing! Appreciate you sharing this blog. Really Cool. I simply want to tell you that I’m new to blogging and site-building and honestly liked your web site. Almost certainly I’m likely to bookmark your website . You surely have wonderful posts. Many thanks for sharing your blog. Pretty! This was a really wonderful post. Thanks for supplying this info. You are truly a excellent webmaster. The site loading speed is incredible. been blogging for? You make this look easy. May I just say what a relief to uncover an individual who genuinely understands what they are discussing on the web. You certainly understand how to bring a problem to light and make it important. More and more people really need to read this and understand this side of your story. I can’t believe you are not more popular because you most certainly possess the gift. Wow, that as what I was looking for thanks for creating this website. Important. More and more people really need to look at this and understand this side of the story. Well I truly liked this newsletter and post. Just wanted to mention how much I enjoyed your web blog. Enjoyed this. Saved to bookmarks! the blog world but I’m trying to get started and create my own. Do you require any coding expertise to make your own blog? Yeah bookmaking this wasn’t a high risk decision. Great post! I enjoy blogging and really appreciate your content. The article has really peaks my interest. I am going to bookmark your site and keep checking for new information. I’ve been absent for some time, but now I remember why I used to love this web site. Thanks again. Do you mind if I quote a couple of your posts as long as I provide credit and sources back to your site? Cheers! I like what you guys are up too. Such intelligent work and reporting! Keep up the superb works. I have incorporated you articles into my blogroll. I think it will improve the value of my web site. I am definitely enjoyed your web blog! You certainly have outstanding stories. This website has genuinely useful advice!